To spark discussion, the Walker invites local artists and critics to write overnight reviews of our performances. The ongoing Re:View series shares a diverse array of independent voices and opinions; it doesn’t reflect the views or opinions of the Walker or its curators. 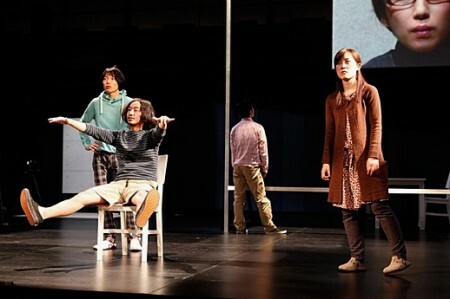 Today, Erin Search-Wells from SuperGroup shares her perspective on Thursday night’s Out There performance of Hot Pepper, Air Conditioner, and the Farewell Speech by chelfitsch/Toshiki Okada. Agree or disagree? Feel free to share your thoughts in comments! All I have to say are good things. So for the purpose of making this interesting at all, instead of just a list of why I like, and what I like, and how the sum of the parts became a whole that was transcendent, I will try to write it, in the fashion of the translated surtitles. Have you noticed that if you go to the theater, sometimes you like it, or it’s really terrible, and then other times, you are dancing after it, or you can’t stop smiling, or perhaps you want to get back into the practice of writing? That is a really fantastic feeling to leave a show with: I have seen something that is truly different and works. It seems like contemporary performance has a recurring challenge in “talking and moving/dancing at the same time.” It should be totally easy for us humans, but somehow it is still a “problem” to solve. This is one solution. Wouldn’t it be great if all human bodies went to workplaces and expressed themselves equally physically and verbally? It would be freedom. There would be no wrong answers. We will see. Maybe on Saturday when I take the class at the Walker, where Toshiki Okada will teach us how to physicalize our unconscious, and repeat, and subvert, then we will see. Maybe I will have it all wrong. Maybe. But I have a feeling that the answer won’t be, “NO! You are doing this wrong! Your body should be moving UP and OUT, and you shouldn’t follow EVERY impulse, only the RIGHT ones, the ones that make SENSE.” I’m pretty sure those voices have no room in this practice. Do we think there has to be a right and wrong way of doing something, for someone to become a master of it? Or can we all do this? I hope I can. I know it will look weird if I start to run around a lunchroom table with my arms wrapped around me, and my knees together, in the real world. So maybe I’ll find secret ways to do it every now and then. I could have watched that part forever, by the way. Also there was a very alarming metaphor about a cicada that will stir you. Well, I wasn’t very successful at writing like chelfitsch surtitles. You should go. You could just watch the movement, you could just marvel/laugh at the writing, or you could flutter between the two.